Hi! My name is Charlie and I am a senior sales associate here at Lindenhurst! I am a native of Northport and a proud alumnus of the Northport-East Northport School District. Having studied music my entire life, my career has taken me to fifteen states and abroad to France, Austria, China, and Southeast Asia, performing in some of the world’s most prestigious venues. 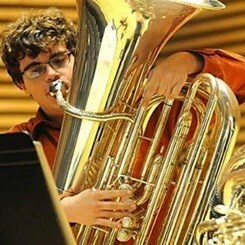 I recently earned my Master in Tuba Performance with Honors at the University of Southern California in Los Angeles, and received his Bachelor of Music at the University of Michigan. I have also studied composition with Bright Sheng, and piano with Frank Doyle, the former keyboardist for Meatloaf. At USC, I was a member of the USC Bass Tuba Quartet, which won First Prize at the International Tuba and Euphonium Conference, the first of its kind to receive this award. I am excited to be a member of the Music & Arts family, and am eager to answer any questions you may have!